Two views of the bust of Bishop Eden, under artificial lighting. Left: Three-quarter view. Right: The whole monument from the front. 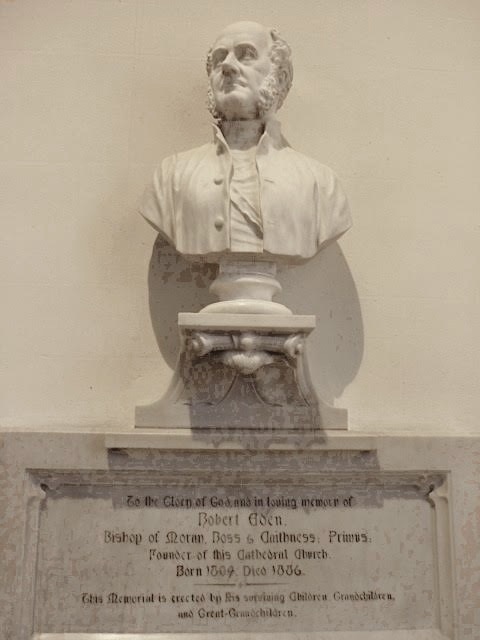 Bust of Bishop Robert Eden (1804-1886) in Inverness Cathedral, by Andrew Davidson. 1890. White marble. Bishop Eden came to Inverness in 1853 from Elgin, where he had been successful in building up church congregations in his diocese, but where the cathedral was in ruins. When the Diocese of Caithness was added to that of Moray and Ross, he felt that Inverness would the most appropriate location for a new cathedral, and such was his influence that in 1866 the foundation stone was laid on the chosen site beside the River Ness by his friend, the Archbishop of Canterbury, Charles Longley ( 1794-1868). The architect was the Episcopalian Alexander Ross. 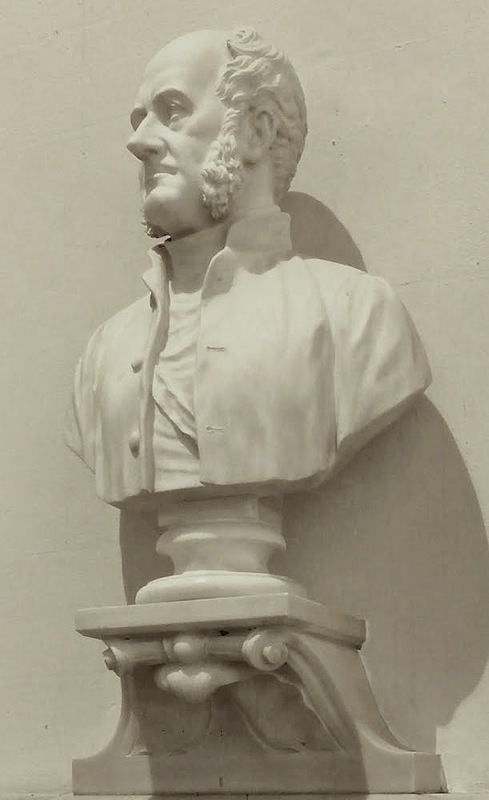 The bust is a fine, dignified portrait of the bishop, and shows considerable progress from the much earlier work on the pulpit — which, after all, was produced by the firm rather than by specifically by Andrew Davidson. "2. Inverness City." www.clandavidson.org.uk. We. 19 December 2017. "The Right Reverend Robert Eden." Am Baile. 19 December 2017.